2) [application]: use “vod” unless you have created a new directory in the application folder of the Flash Media Server installation directory. There are two built in applications vod and live. 4) [streamname]: use the name of your video file (including the extension). The extension can be flv, f4v or mp4. You do not need to prefix the file name with the content type (e.g. mp4:). 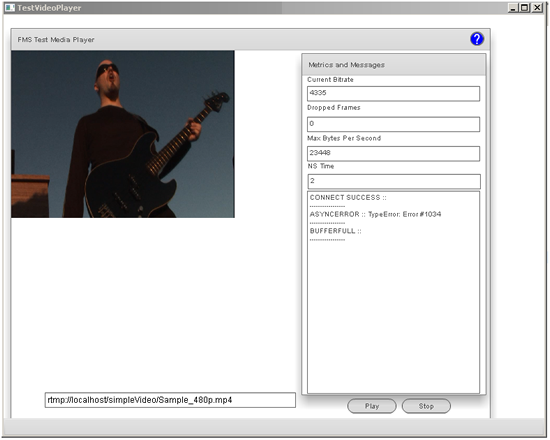 The application reports Current Bitrate, Dropped Frames as well as Max Bytes Per Second and other useful messages. When you stop the video you will be presented with a graph and grid of the captured data.